To complement the IMG Cable Coupler Systems, IMG continues to design and offer clients various trailing cable coupler accessories in order to fill specific application and operations' needs. Other accessories arise from operations' equipment preferences. For example, some operations prefer to use a male-female-male system to reduce downtime caused by cable reel position. This type of operation uses male couplers on both ends of the cable and an adapter body or the new adapter box that allows for easier interior terminations. 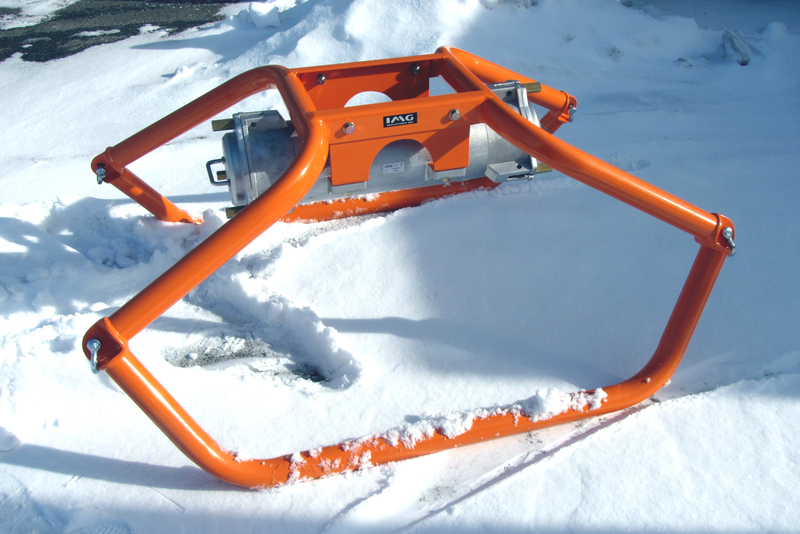 The adapter is equipped with a HD Skid that elevates the complete coupler system off the ground to prevent damage. Heavy-duty Cages for use in compact spaces. Increasing industry safety policies and standards are our main focus when designing equipment for the mining and other related industries. As a result, we have developed several, first-of-its-kind features that drastically increase equipment operation and personnel safety. Available on the most of our cable coupler systems, is an optional safety feature that detects and indicates live voltage presence in the cable coupler. This IMG LED Live Line Indication System TM provides an operator with visible indication of an energized coupler*. The IMG LLIS is intrinsically safe and does not require secondary source of power. The use of LED lamp and double redundancy circuit ensures minimal failure. An innovative, dual IMG Key-Interlock System TM option is also available on the most of the IMG Cable Couplers and that provides an additional safety step to prevent disconnection of live components and equipment. The first, industry standard key-interlock is available on the Equipment-Mount Couplers and prevents the coupler from being connected to a Cable-Mount coupler while out of commission. The second, new and improved Key-Interlock System, is designed to prevent the un-coupling of the Equipment-Mount Coupler from the Cable-Mount Coupler and/or its Cover without authorized key-access. this design is such that the access key corresponds to the power source (switch house) and the unit cannot be un-coupled without the corresponding power source being disconnected from load. Available on the most of our cable coupler systems, is an optional safety feature that prevents fast coupler separation or un-coupling and, therefore, causing a potential short/flash arc. This eye-bolt system developed by IMG, is designed such that it provides apply time for pilot circuit to trip before a coupler can be fully disconnected (un-coupled). Each operation using cable couplers can have different preferences on the type of a system to be used. Some operations use a standard MALE-to-FEMALE connection, while others prefer MALE-FEMALE ADAPTER-MALE system (aka Pig) to reduce downtime caused by cable reel position. This type of operation uses male couplers on both ends of the cable and an female adapter body to connect cables. 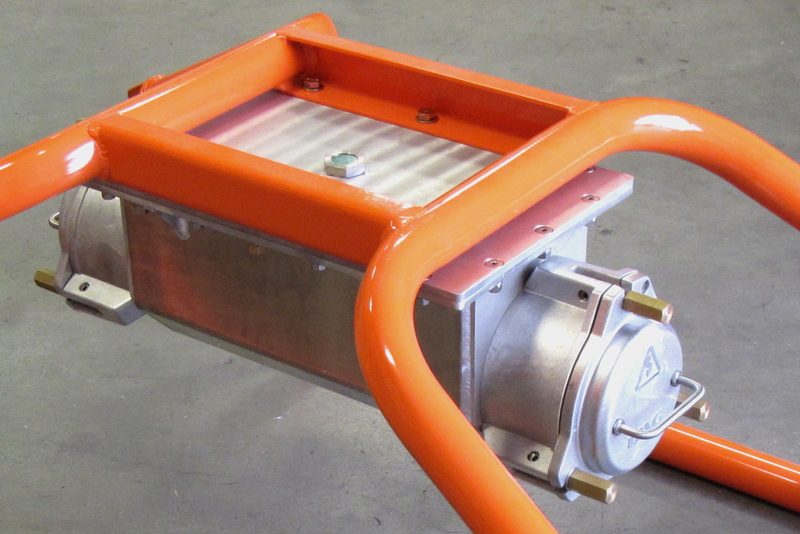 The adapter is equipped with a HD Skid that elevates the complete coupler system off the ground to prevent damage. The adapter box is also equipped with a HD Skid that elevates the complete coupler system off the ground thus preventing damage. All IMG Skids are powder-coated for maximum durability. Typically, safety orange is used for increased visibility but other colors are available upon request. Hi-Viz stickers and markers are also available upon request. This new coupler skid is made from heavy-duty tubbing to withstand the rough pit environment where the medium voltage couplers are typically in use. 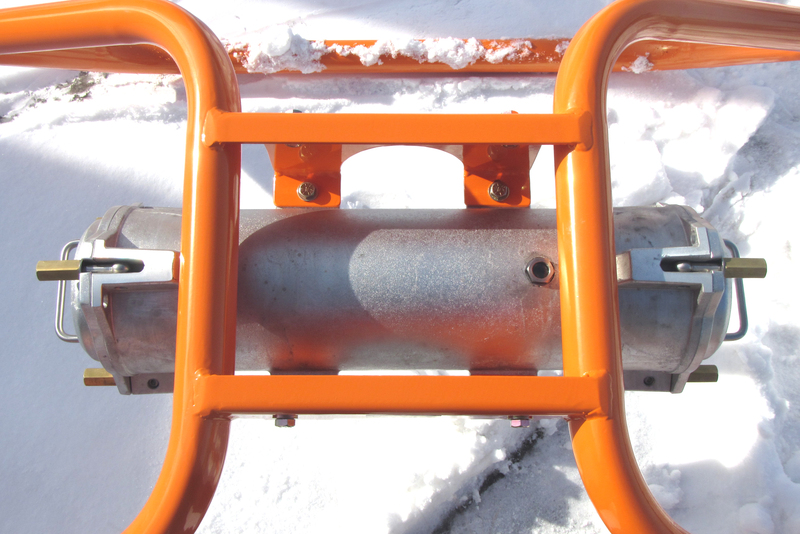 The robust, "roll-over" design protects the coupler at all times as the coupler remains elevated from the elements. Another new feature for the IMG Roll-Over Skid is the ability for disassembly. This feature allows for reduction of transportation/delivery costs to site and maximizes warehousing space. These skid are available with kits to fit other coupler brands on the market. These skids are made to elevated the Coupler Adapter (aka PIG) or the IMG Adapter Box from the site elements, make them more visible to operators and well as make them easier to connect and disconnect from Male Couplers. 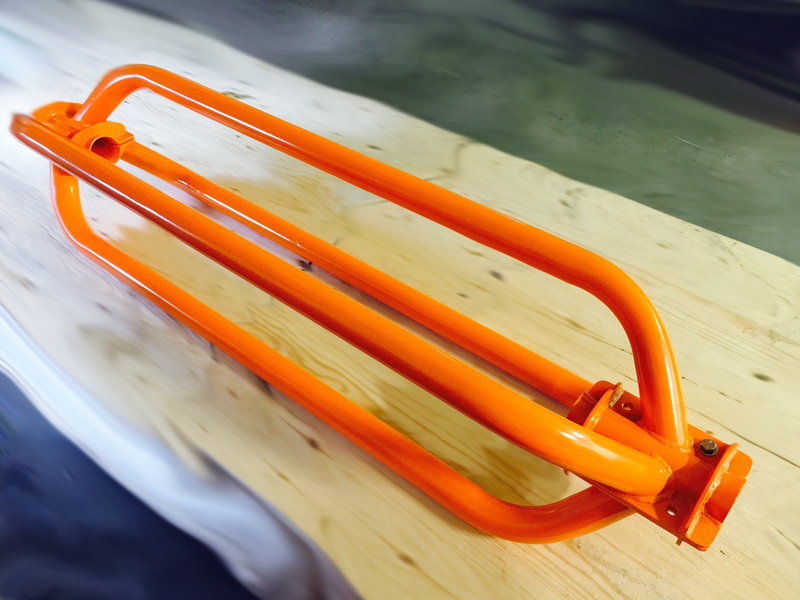 Also manufactured from heavy-wall tubbing, these skids can take the abuse from the site environment, while protecting the coupler assembly from damage. The under-mount, wide-stance design minimizes the likeliness of a roll-over. 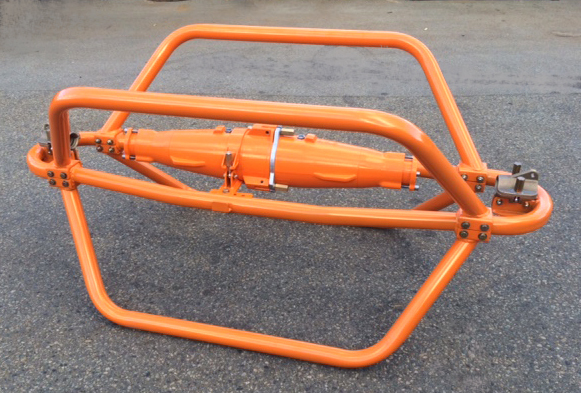 The Coupler Cage was developed for a client with a need for coupler protection in minimal space requirements. These cages are powder-coated for maximum durability and fit other coupler brands without any additional kits. Each set of IMG Coupler System has specific bolts, screws and other hardware that requires tools when terminating the couplers to trailing cables. Most of the tools used by our coupler technicians are standard hand tools, but through time and experience, certain types or brands of tools have become preferred. This set of tool for each coupler system can be supplied by IMG for fast, easy and dedicated access for coupler assembly and disassembly. IMG utilizes cable adapters to replace typical termination for coupler-to-cable for couplers rated 8kV and higher. These adapters are reusable and easy to install thus reducing termination costs and installation time costs.